Come and see our nearly 20 acres of trees, shrubs, and plants. Our Garden Center also features a Bird Barn and Pond Department. Be sure to visit the Mill House and see our wonderful line of gift items. 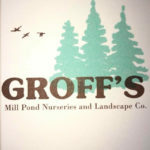 Our staff experts look forward to seeing you at Groff’s Garden Center soon.